Pretty Little Liars is an American teen drama mystery thriller television series developed by I. Marlene King and is loosely based on the novel series of the same name written by Sara Shepard. The series follows the lives of four high school girls whose clique falls apart after the disappearance of their leader. One year later, the estranged friends are reunited as they begin receiving messages from a mysterious figure named "A" who threatens to expose their deepest secrets. The series features an ensemble cast, headed by Troian Bellisario as Spencer Hastings, Lucy Hale as Aria Montgomery, Ashley Benson as Hanna Marin, Shay Mitchell as Emily Fields, Sasha Pieterse as Alison DiLaurentis and Janel Parrish as Mona Vanderwaal. Teen Wolf is an American supernatural teen drama television series developed by Jeff Davis for MTV. It is loosely based on the 1985 film of the same name, and stars Tyler Posey as a teenager named Scott McCall, who is bitten by a werewolf and must cope with how it affects his life and the lives of those closest to him, and Dylan O'Brien as "Stiles" Stilinski, Scott's best friend. The series received generally positive reviews from critics. The Penobscot (Panawahpskek) are an indigenous peoples in North America with members who reside in the United States and Canada. They are organized as a federally recognized tribe in Maine and as a First Nations band government in the Atlantic provinces and Quebec. Aria Marie Montgomery is a fictional character in the Pretty Little Liars series created by American author Sara Shepard. She is portrayed by Lucy Hale in the television adaptation, which premiered on ABC Family in June 2010. Lucy Hale was named Favorite Cable TV Actress at the 2014 People's Choice Awards for her role in the series. Back to You is an American sitcom which aired on Fox from September 19, 2007, to May 14, 2008. The creators and executive producers were Christopher Lloyd and Steven Levitan, and the director was James Burrows. The series starred Kelsey Grammer and Patricia Heaton as squabbling anchors of a news program. Sasha Pieterse-Sheaffer is a South African-born American actress and singer-songwriter. She is known for her role as Alison DiLaurentis in the Freeform series Pretty Little Liars and its spin-off Pretty Little Liars: The Perfectionists. Upon the success of Pretty Little Liars, Pieterse earned a supporting role as Amy Loubalu in the 2011 Disney Channel film Geek Charming. In 2013, she starred in the teen comedy film G.B.F.. In 2017, Pieterse participated in the 25th season of Dancing with the Stars and finished in 10th place. Janel Meilani Parrish Long is an American actress and singer. She is best known for playing Mona Vanderwaal on the Freeform mystery drama series Pretty Little Liars. She is also known for portraying Young Cosette in the Broadway production of Les Misérables (1996), and Jade in the teen comedy film Bratz (2007). In 2014, Parrish participated in the 19th season of Dancing with the Stars, taking third place. She also appeared in the 2018 Netflix film To All the Boys I've Loved Before. Karen Lucille Hale is an American actress and singer. Early in her career, she was sometimes referred to as Lucy Kate Hale. She is best known for her role as Aria Montgomery on the Freeform series Pretty Little Liars (2010–2017). Some other notable roles in television played by Hale include Becca Sommers in Bionic Woman (2007), Rose Baker in Privileged (2008–2009) and Stella Abbott in Life Sentence (2018). Hale has appeared in films, The Sisterhood of the Traveling Pants 2 (2008), Sorority Wars (2009), A Cinderella Story: Once Upon a Song (2011), Scream 4 (2011), Truth or Dare (2018) and Dude (2018). Troian Avery Bellisario is an American actress. She is known for playing the role of Spencer Hastings in Freeform's Pretty Little Liars. Shannon Ashley Garcia"Shay"Mitchell(born 10 April 1987) is a Canadian actress, model, entrepreneur and author. She rose to prominence starring as Emily Fields in the Freeform series Pretty Little Liars (2010–2017). In 2018, Mitchell began starring in the psychological thriller series You, and headlined the horror film The Possession of Hannah Grace. Ian Harding is an American actor. He is known for his role as Ezra Fitz in the Freeform television series Pretty Little Liars (2010–2017). Alison Lauren DiLaurentis is a fictional character on Freeform's Pretty Little Liars, a television series which is based on a book series of the same name written by American author Sara Shepard. In the beginning of both the books and the television series, Alison is a central character who is shown mostly in flashbacks. The narrative is set when Alison mysteriously disappears and leaves the suburb of Rosewood shocked. Due to her position as a queen bee of Rosewood's social scene, Alison's actions and relations were constantly under scrutiny from the town's citizens. Sasha Pieterse, who portrays Alison on screen, has described the character as an indecisive person, showing herself as a ruthless, manipulative girl. Due to the massive reformulation on the story's timing, pacing and overall narrative for the television adaptation, the on-screen Alison DiLaurentis holds various differences from her literary counterpart, such as the fact that the latter has a identical twin sister, while the former does not. Brant David Daugherty is an American actor, known for his recurring role as Noel Kahn on the teen drama television series Pretty Little Liars. In 2013, he had a recurring role as Brian in the NBC daytime drama Days of Our Lives. The third season of Pretty Little Liars, based on the books of the same name by Sara Shepard, premiered on June 5, 2012 on ABC Family and concluded on March 19, 2013. On November 29, 2011, ABC Family renewed the series for a third season, consisting of 24 episodes. Filming of the season began on April 2, 2012. The fifth season of Teen Wolf, an American supernatural drama created by Jeff Davis and to some extent based on the 1985 film of the same name, received an order of 20 episodes on June 24, 2014, and premiered on June 29, 2015. The second episode aired the day after, on June 30, 2015, then returned to the regular schedule on Mondays. Ina Marlene King is a writer, producer and director. She is best known as the executive producer and showrunner of the Freeform teen drama Pretty Little Liars. She also wrote the 1995 film Now and Then. In 2014, it was announced that King will adapt Danielle Vega's horror novel The Merciless as a feature film and Sara Shepard's novel series The Perfectionists as a television series for Freeform. The sixth and final season of Teen Wolf, an American supernatural drama created by Jeff Davis and to some extent based on the 1985 film of the same name, received an order of 20 episodes on July 9, 2015, and premiered on November 15, 2016. The second half of the season premiered on July 30, 2017. The seventh and final season of the American mystery drama television series Pretty Little Liars, based on the books of the same name by Sara Shepard, was renewed on June 10, 2014 for two additional seasons, making the show Freeform's longest running original series. Pretty Little Liars: The Perfectionists is an American drama mystery thriller television series created by I. Marlene King. The series is a sequel to Pretty Little Liars and based on the novel The Perfectionists by Sara Shepard. Freeform ordered the pilot on September 25, 2017, as the second spin-off series of Pretty Little Liars which would include some of the main characters from that series. It is the third series in the Pretty Little Liars franchise. Freeform picked up the series for a 10-episode season on May 14, 2018, which premiered on March 20, 2019. The Pretty Little Liars franchise is a multimedia franchise consisting of two book series, short stories, three television series, four television specials a web series, and one television soundtrack. The initial novel of the same novel was first published in 2006. The first television series also entitled Pretty Little Liars began airing on ABC Family in June 2010; meanwhile, additional books continued to be published. A television soundtrack called "Pretty Little Liars: Television Soundtrack" was released in 2011. Pretty Dirty Secrets, a web series was released on ABC Family's website in the fall of 2012 along side the third season of Pretty Little Liars. The second series to make it to television, Ravenswood, aired on ABC Family from 2013 to 2014 and was cancelled after one season. Pretty Little Liars was later cancelled and aired its final episode in June 2017. The first book of The Perfectionists was released in April 2014 and a second book in 2015. A television series for The Perfectionists was developed and later reworked into a spin-off and sequel of Pretty Little Liars with the title Pretty Little Liars: The Perfectionists which premiered in March 2019. 1 2 3 "Codie Christian". Hollywoodlife. Retrieved July 1, 2016. ↑ Codie Christian [@ReallyCody] (April 15, 2015). "THANK YOU ALL SO MUCH FOR THE BIRTHDAY WISHES. I'm truly humbled and have no idea how to express my gratitude" (Tweet). Retrieved July 1, 2016– via Twitter. ↑ Avery Thompson (August 24, 2015). "'Teen Wolf' Finale: Game-Changing Reveals, Theo & Malia's 'Connection' & More Scoop". Hollywoodlife. Retrieved August 31, 2015. ↑ Andre (May 31, 2018). "New Show "All-American" this fall on The CW". Cody Christian.co. Retrieved July 31, 2018. ↑ Cody Christian (August 19, 2014). "Cody Christian Tweet". Twitter . Retrieved August 8, 2017. ↑ Ashley Bohall (November 19, 2016). "Ashley Bohall Tweet". Twitter . Retrieved August 8, 2017. ↑ Brie Hiramine (March 24, 2016). "<3: Cody Christian Writes a Beautiful Message About Mom's Struggle With Breast Cancer". J-14 . Retrieved August 8, 2017. ↑ Cody Christian (September 9, 2015). "Cody Christian Tweet". Twitter . Retrieved August 8, 2017. ↑ Andy Swift (November 8, 2013). "'The Starving Games': Cody Christian Previews His Twisted Take On Peeta". Hollywoodlife. Retrieved July 10, 2015. ↑ Megan Vick (February 10, 2015). "'Teen Wolf' brings 'Pretty Little Liars'' Cody Christian into the pack". Zap2it . Retrieved July 1, 2016. ↑ Julianne Ishler (February 10, 2015). "Cody Christian In 'Teen Wolf': 'Pretty Little Liars' Hunk Joins 5th Season". Hollywoodlife. Retrieved July 10, 2015. ↑ Borys Kit (October 23, 2013). 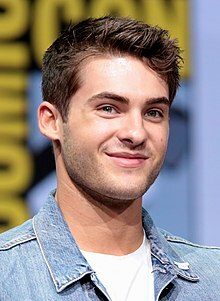 "'Pretty Little Liars' Actor Cody Christian, Tim Daly Join Indie Thriller 'Submerged'". The Hollywood Reporter . Retrieved July 10, 2015. ↑ Nellie Andreeva (January 18, 2012). "Five Cast In NBC Pilot 'Beautiful People'". Deadline Hollywood . Retrieved July 1, 2016. Wikimedia Commons has media related to Cody Christian .